Since the launch of the OMEGA Seamaster Aqua Terra collection, it has been warmly received by watch enthusiasts who have raved about its blend of eye-catching design excellence and innovating watchmaking technology. OMEGA now introduces a number of stunning new family members: the mid-sized Seamaster Aqua Terra Jewellery Co-Axial 38.50 mm watches. Like the rest of the collection, these new Aqua Terras feature the trademark “Teak Concept” dial whose vertical lines are reminiscent of the wooden decks on luxury boats. The Seamaster Aqua Terra Co-Axial is powered by OMEGA’s revolutionary Co-Axial technology which delivers longer service intervals and outstanding long-term chronometric performance. Each timepiece is a COSC-certified chronometer. All of the mid-sized Co-Axial watches have facetted 18 Ct gold hands with diamond-polished sides and brushed tops; the hour and minute hands are coated with Super-LumiNova. Their polished screw-in sapphire crystal casebacks make it possible to appreciate the precision performance of the Co-Axial movements which power the watches. The new timepieces are available in a number of distinct configurations, two of which are highlighted here. 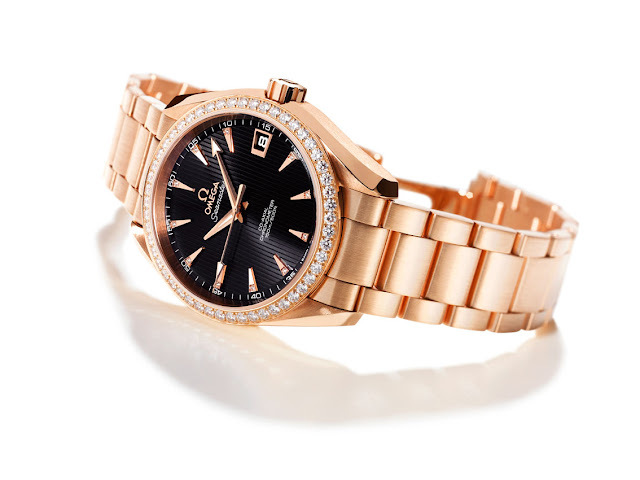 The OMEGA Seamaster Aqua Terra Jewellery Co-Axial in 18 Ct red gold combines the sparkle of diamonds with the technical innovation and excellence of the luxury-finished OMEGA Co-Axial caliber 8501. The movement has a special luxury finish with an 18 Ct gold rotor and balance. Its bezel is paved set with 52 full-cut diamonds and eleven single-cut diamonds mark the hours. There is a brushed 18 Ct gold applied date window at 3 o’clock. The lacquered teak-black dial has vertical lines associated with the watches in the Aqua Terra collection. The watch is presented on either a brushed 18 Ct gold bracelet with OMEGA’s patented screw-and-pin system and a safety clasp or a black alligator leather strap with a foldover clasp. 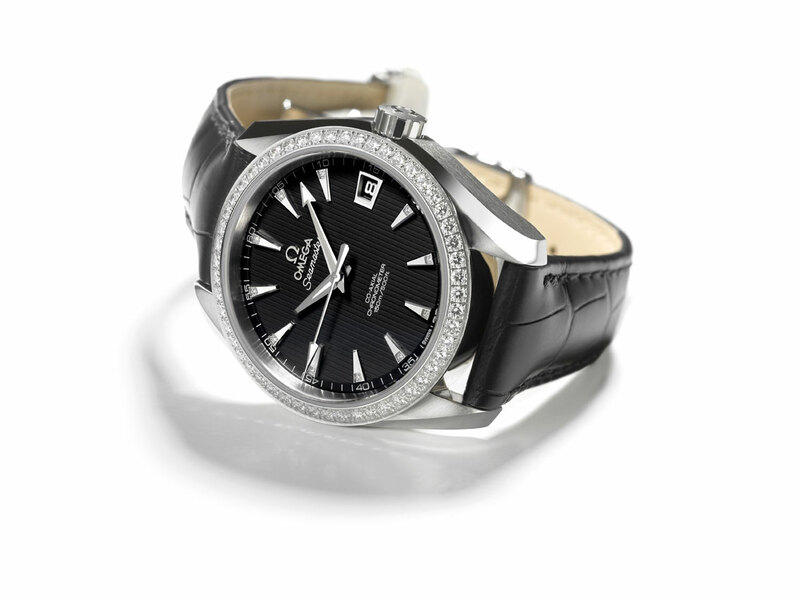 The stainless steel edition of the Seamaster Aqua Terra Jewellery Co-Axial watch also dazzles with diamonds. Like its 18 Ct red gold counterpart, it has a brushed and polished case and a bezel paved with 52 full-cut diamonds. It also features the eleven single-cut diamond hour markers. The stainless steel version has a vertically brushed lacquered black dial. At the heart of the watch is the exclusive OMEGA Co-Axial caliber 8500 working in conjunction with a free sprung-balance for unparalleled timekeeping performance. The diamond-enhanced stainless steel watch is offered with choice of a black alligator leather strap with a foldover clasp or a stainless steel bracelet with OMEGA’s patented screw-and-pin system and a safety clasp.